Lodge to lodge treks offer the best means to take part in trekking without compromising comforts, when it comes to lodging, food and other amenities. Tour operators go beyond offering comfortable lodgings and great treks, as they enable visitors to experience the history of the Incan land alongside the contemporary expression of the deep-seated culture, and the exotic flora and fauna of the region. The expedition takes visitors on the Salkantay Route that has four mountain lodges sited at strategic points on the route. 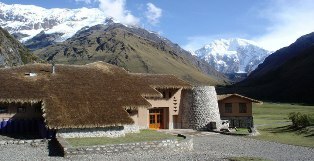 The Salkantay lodge at Soraypampa is the ‘crown jewel’ of the lodge to lodge trekking system. It gets the name from Mount Salkantay, the second most sacred peak of the Incas. Tour operators transfer their guests from Cusco to the Salkantay Lodge and Adventure Resort (SLAR). En route, they visit the Tarawasi, a site of Incan ruins near Lamatambo before reaching Marcoccasa, where they begin the trek to Soraypampa via the ‘Camino Real’ meaning the ‘Royal Path.’ All tour itineraries allow visitors to spend a day at each of the four lodges. The other three lodges are Wayra Lodge at Huayraccmachay, Collpa Lodge at Collapapampa and Lucma Lodge at Lucmabamba. A seven-day tour offers a convenient itinerary that begins at Cusco. As said above, visitors are transported from their Cusco hotel to Soraypampa. On the way, you may visit the Tarawasi ruins and the mountain village of Mollepata before climbing up a winding road to Marcoccasa. This is where the trek begins to Soraypampa through the ‘Camino Real’, a six-hour trek to the Salkantay hotel, where you spend the night. On the second day, you are taken on an optional acclimatization hike to Lake Humantay and return to Salkantay hotel for the night. Tour operators also offer horseback riding. Starting early the next day, you hike up the Rio Blanco valley and traverse the Salkantay Pass, the highest point on the path. It gives amazing views of the Vilcabamba Range. Descending down, you reach the Wayra Lodge to spend the night. The descent continues the next day through Salkantay River bank and you reach Collpa Lodge, sited on an open plateau at the convergence of three rivers. The following day, you hike on the Santa Teresa river valley, a populated rural area. After noon, you take a short drive to reach the head of the Llactapata Inca Trail. The trail leads to the Lucma Lodge, where you spend the night. Walking uphill for a few hours the next morning, you reach the Llactapata Pass, and a subsequent descent leads to the Aobamba River. Finally, you take a train ride to Aguas Calientes, the town near Machu Picchu. After spending the night at a hotel, the next day, you are taken to Machu Picchu via bus. The return journey to a Cusco hotel concludes the trip. A week-long lodge to lodge trek costs around $2,400 to $5,000 per head. Tour packages vary according to the operator. They usually include the stay at the four lodges, meals for the trek, horses to carry camping equipment, bus fares, train fares and other optional facilities or additional days.